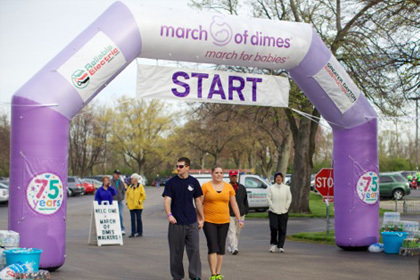 Saving babies' lives is what the March of Dimes is all about. For decades, it has worked to prevent birth defects, premature births and infant mortality through research, community service, education and events like the "March for Babies" races. "[There was] fun, excitement, and encouragement for everyone to actually walk under/through [the arch] and it worked. We have cheerleaders and small children at the finish line by the arch handing out stickers, saying ‘I did it.’ Before we had the arch, [people] would straggle in anywhere. "Everyone loved it and talked about it all day at the event! And the sponsors should be very happy!" In addition to the quality and service the March of Dimes received, Jackie also specifically mentioned how much they liked the removable sponsor signage option, the D-rings and other features. This towering, bright-purple inflatable archway was also easily spotted even in the midst of a huge crowd. Just one more thing to love! Looking for more creative fundraising inflatables? Browse our online galleries!